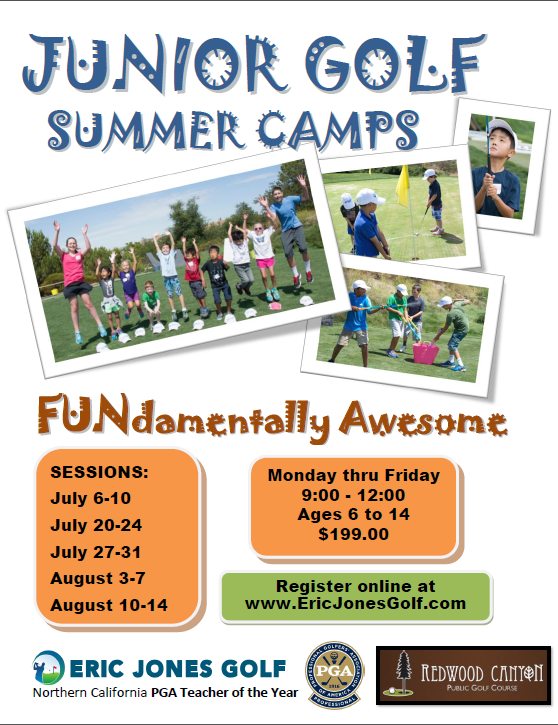 Junior Summer Camps at Redwood Canyon – Get Better. On Purpose. Time: 9:00-12:00 Monday thru Fridays, with on-course play on Friday (see a sample daily schedule below). Juniors may be dropped off at 8:40 am. Note: Level 1 camps are for new and younger golfers. If your junior has never picked up a club before, put them in the Level 1 class regardless of age. Level 2 camps are for juniors who already know grip, stance, and alignment and can hit the ball most every time they swing at it. Select camp level based on your junior’s skill level rather than age. Call Andy Andy Morris, camps coordinator, at amorris@ericjonesgolf.com, 510-415-6302. You may also reach out to Eric Jones at ejones@ericjonesgolf.com, cell 650-274-3890. We’re very accommodating. PS – Don’t forget that we have a year-round program for juniors. Check out The Junior Golf Academy for juniors who would like to take their game to the next level thru weekly coaching. To learn more about the details of our summer camps, read on! Summer golf camps are a great way to introduce juniors to golf, have lots of fun, and meet new friends. Our summer camps focus on building solid fundamentals in the most important parts of the game: putting, chipping, and the full swing with irons and woods. But we also have plenty of fun with golf-related games and activities. We keep our group sizes small – no more than 6:1 student to teacher ratio – so juniors get lots of personal attention and instruction. They also get the chance to meet our coaches – the same coaches who teach our year-round junior Academy program. Sessions are organized roughly by age and more importantly by skill levels so juniors learn similar skills with other kids their own age and ability. If you are not sure which level to select for your junior, give more weight to skill level rather than going strictly by age. New golfers get a lot of emphasis on basics, while the more experienced juniors work on more complex skills. We teach skills in a supportive and positive environment that helps them learn how to play great golf while building character and valuable life skills. Studies show that juniors develop a higher level of self-esteem and stay with sports longer when the emphasis is placed on effort rather than results. That’s why you’ll find our coaches cheering right along with our juniors every step of the way. Sessions run June, July, and part of August, Monday thru Friday, from 9:00 am to 12:00 pm. Check-in starts at 8:40. Pick-up is at 12:00. We’ve planned out each day, each learning activity, and and plenty of golf-related fun. Juniors are kept busy and on the move, rotating through two or three stations each session, depending on the size of the class. 3. Appropriate clothing. Layers work best. It may start off chilly in the morning, but is usually quite warm by the end of session. 4. Water bottle. We’ll have water, but best if your junior brings their own bottle. 5. Hat. Glove. Shoes. (tennis shoes are preferred. When we go on-course, golf shoes are ok). One reason our camps and Junior Academy sessions are so successful is our coaches. We bring experience, wisdom, and passion to our coaching sessions every day. Lead coach Eric Jones is the Northern California 2014 PGA Teacher of the Year. Eric played his college golf at Stanford and also coached college golfers at Stanford. Two of his players went on to capture the NCAA team championship title. Eric is one of only a handful of PGA professionals in the country who also holds a Masters Degree in Sport Psychology. He is a 2-time World Long Drive Champion who knows how to compete successfully at the highest levels. He credits his knowledge of the mental side of performance with helping develop his mental toughness and competitive drive. Eric writes golf instruction books and gives talks and seminars for the PGA and major corporations all over the country. Andy is passionate about the art and science of teaching golf. His specialty is keeping the game simple, making it easier to learn and more enjoyable to play. Growing up Andy played just about every sport with a ball, including football and competitive baseball in high school. But what got him hooked on golf was the lifelong challenge and what he learned about himself, including patience, honesty, integrity, and overcoming adversity. He knows these aren’t just golf skills – they are life skills. That’s why he shares the lessons he’s learned with all his students. Andy specializes in working with new golfers and in developing juniors. By sharing his own life experiences he instills the same passion he has for golf in his students. The other advantage we provide is our emphasis on learning how to play, not just swing a club. Once a junior has mastered the ability to make contact we start providing instruction on playing skills – not just hitting the ball, but hitting it in the right places and learning how to get it in the hole. The key to scoring is understanding how to develop a winning strategy. Shot by shot.Hole by hole. Round by round. If you have any questions not answered on the site, please send an email to Andy Morris at amorris@ericjonesgolf.com 510-415-6302 or Eric at ejones@ericjonesgolf.com, or call 650-274-3890. We look forward to seeing you at golf camp this summer!